SANTA CLARA, CA—August 8, 2018— IT Brand Pulse, a trusted source for research, data and analysis about data center infrastructure, will honor 2018 Innovation Leaders—as voted by IT pros in Flash Storage related product categories—at Flash Memory Summit on Wednesday, August 8 at 2:00 p.m., Mission City Ballroom, Santa Clara Convention Center. Intel – NVDIMM, PCIe NVMe Card SSD, Ultra-Low Latency SSD and a Special Achievement award: Contributions to Innovation: Ultra-Low Latency Storage for Edge Computing over the past five years. 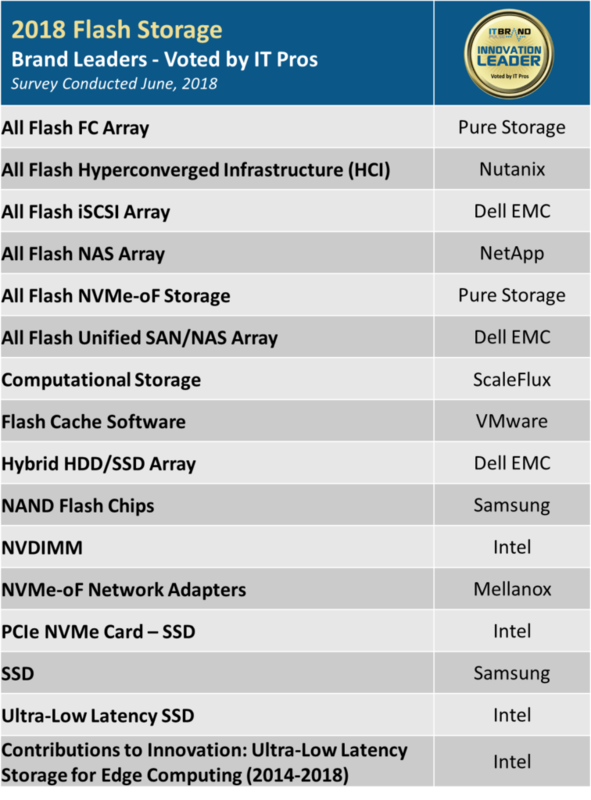 Flash Memory Summit, produced by Conference ConCepts, showcases the mainstream applications, key technologies, and leading vendors that are driving the multibillion dollar non-volatile memory and SSD markets. Now in its 13th year, FMS is the world’s largest event featuring the trends, innovations, and influencers driving the adoption of flash memory in demanding enterprise storage applications, as well as in smartphones, tablets, and mobile and embedded systems.